I’ll admit it – studying for the bar exam is hard, lonely work. My days are long and boring. I’m trying to keep my stress in check, and it’s starting to be a challenge. I initially felt guilty when I banned everyone from house for the duration of bar prep, but now I’m so grateful I did that – and so is everyone else. I can do my own thing all day without bothering anyone and then I decide when I interact with the world. It sounds self-centered (and it is) but it’s necessary. In case you wanted to know, here’s what a day in the life of my bar prep looks like. 5:45am: Get up, Work out, Shower, Breakfast, Check email. 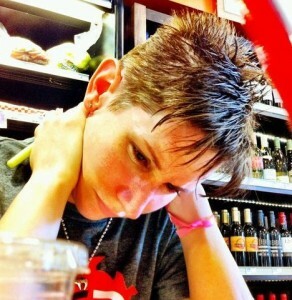 7:30am: Study – often using the Pomodoro Method. 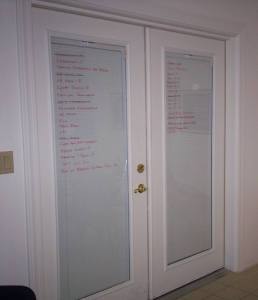 I turn the French doors into my to-do list every day. 12:00pm: Meet up with my carpool group. 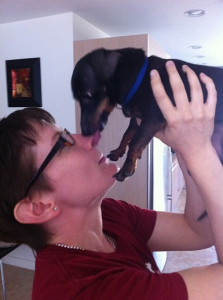 The highlight of my day is getting to play with my friend’s dog, Oscar. 7:00pm: Study, sometimes in the pool when I need to avoid all distractions. Studying for the bar involves a lot of sitting which results in my body getting all types of sore. During my study breaks, I often ice my sore back, neck and shoulders. I’m grateful when my massage therapist, Thomas Porter, runs a special so I can afford him. I told him that he needs to run one the week before the bar exam. My one weekly indulgence is still watching Deadliest Catch on Tuesday nights. It reminds me that studying is nothing compared to working on a crab boat in the Bering Sea. Every so often I have a mini freak out and I reach out to my lawyer friends who have survived the bar. Their calls and emails keep me grounded. They all say that if I follow the BarBri program that I’ll be fine. If you’ve never studied for the bar, you have no idea what this is like. A lot of the time, we’re not in a good mood. Don’t be surprised if we have a short fuse when it comes to distractions and annoying things. Don’t take it personally if we don’t have time to hang out or even return phone calls. We can be optimistic about passing the bar and not be pleasant to be around in general. If we’re in a bad mood, it’s not your job to make us laugh. When we take a study break, there’s a good chance we don’t want to talk about how studying is going. We may have nothing to talk about because all we do is study so fill us in on what’s going on in the real world. After much anticipation, the Sandra Day O’Connor College of Law at Arizona State University announced the members of the committee in charge of selecting a new dean of the law school last week. These 12 people have the somewhat daunting task of finding someone who is a good fit for the school and its future. I was incredibly pissed off at ASU when I graduated because I felt that Berman disrespected the law student body, and I disagreed with many decisions the school made under his administration. I made the decision that ASU had had enough of my money and that I would not be a donor as an alumnus unless changes occurred in the school. I’m actually quite invested in who the committee selects. I sent the following letter to the members of the committee this week. Congratulations on being appointed to the selection committee for the new dean of the law school at ASU. When I started law school at ASU, I was excited about being a Sun Devil and the opportunities that ASU had to offer. However, by the time I graduated, I felt like a commodity that the school could use at it pleased and not the consumer that the school was supposed to serve. I felt like I was expected to pay my money and say “thank you,” without any recourse when I was unhappy with the school. I decided that the law school had received enough of my money. I made the commitment not to financially support the school unless there were significant changes. I couldn’t even donate my graduation regalia back to the school because it would count towards the class gift. I know that I’m not the only member of my class who has made the commitment not to donate money to the school until things change. I would like to be a supporter of the law school again. There are some traits and policies that I would have to see from the new dean in order to feel comfortable financially supporting the school. Spokesperson: The dean will be the face and the voice of the law school. It is imperative that the new dean be eloquent, thoughtful, and have the ability to adjust their message to occasion. The new dean should also understand that less is more at most speaking engagements. Transparency: It is well known that ASU, like other law schools, manipulates its statistics to give the impression that more students are employed after graduation by counting people who are not employed in the legal profession or only have temporary employment. Regardless of whether the U.S. News changes its reporting requirements, the school should have accurate data available on its website to give prospective students an accurate depiction of post-graduate employment opportunities. Tuition Expectations: The average student debt was $51,000 when I started law school. By the time I graduated, the average debt was $89,000. This is unacceptable. The tuition per semester increased by 33% between my first semester and my last semester of law school. Students need to have some stability related to what they are expected to pay in tuition by being able to lock in their tuition or having a guarantee that their tuition will only increase by a set amount. Practical Professional Training: Although the law school has taken steps to expose students to job possibilities that go beyond big law firms and judicial clerkships, the school needs to do more to expand students’ views on the versatility of their law degrees. Moreover, the law school should require more practical skills training that will be immediately useful when they begin practicing law. Respect for Students: The new dean must have the utmost respect for students who are putting their trust and money in the school to prepare them for their professional futures. During the final year of the Berman administration, he announced that tuition would be increasing by at least $1,500 per student, and he had the audacity to publicly state that the increase was not significant. That was a huge increase! The new dean must open to the student experience, solicit and utilize feedback from them when decisions will be made that will affect their classroom experience or their tuition. Out of respect for students, the new dean should insist that the law school’s budget should be available online so students can see what monies are coming and how they are being spent. I hope you have a wonderful selection of candidates to choose from in your search for the new dean. Please select the person who is right for the job and not someone who is merely good enough. Do not feel pressured to select someone by January if you have not found the right candidate by then. I hope the committee understands that I did not intend my letter to be mean or a criticism of any members of the committee who are part of the law school’s administration. I only wanted to share my wish list for the new dean so that I can like my school again. My friend, Evo Terra, is an ordained minister through the Universal Life Church. If you have five minutes and an internet connection, you can be ordained too. He’s performed a handful of marriages over the years but this weekend he performed a most unusual marriage ceremony. The bride and groom were in North Carolina and he performed the ceremony over the internet via webcam. When he agreed to perform the ceremony, he put the responsibility on the couple to make sure that the marriage is legitimate. In California, Colorado, Montana, and Texas, you can have a marriage by proxy, where a third person stands in for the bride or groom who is unable to be there. If it’s possible to get married when the bride or groom isn’t physically present in the room, is the marriage valid if the minister isn’t physically present? According to the law in North Carolina, all you need to have a valid marriage is a marriage license and a consenting heterosexual couple who freely, seriously, and plainly take each other as husband and wife in the presence of an ordained minister of any religious denomination. The law does not provide any specifics regarding where the minister needs to physically be during the ceremony. I would not be surprised if the couple signs their marriage license and sends it to Evo, who then signs in and sends it in to the appropriate recording office in North Carolina, that they would accept it without batting an eye. This issue boils down to what is does it mean to have a marriage ceremony in the presence of a minister. I could not find a definition for “presence” in the North Carolina marriage laws. Is a being present live via web cam enough or must the minister be physically present in the room? This issue reminds me of the use of proxy signatures on a will. In Arizona, if a person cannot sign their will themselves, they can direct someone else to sign it for them in their “conscious presence.” The requirement of conscious presence could not be fulfilled over the telephone, and probably not via web cam according to my Decedent Estates professor. North Carolina only requires a proxy signature on a will to be completed in the person’s presence and at their direction. I don’t know if the definition of “conscious presence” in Arizona is the same as “presence” in North Carolina. 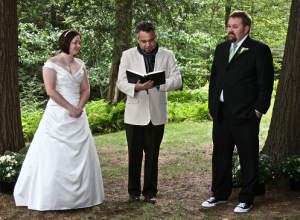 Did my friend perform a valid marriage ceremony this weekend? I don’t know. I called Wake County in North Carolina. Someone there said that the marriage laws have not been changed since they were enacted; therefore the marriage isn’t valid unless the minister is physically in the same room with the bride and groom. She basically said that since marriage couldn’t be performed over the internet in the past, they can’t be performed over the internet now. I think that answer is incomplete and that this issue deserves some exploration. I don’t think this issue is going to have a legal answer unless someone goes to court and claims that their marriage that was officiated via web cam wasn’t a valid marriage. That probably will not happen unless a spouse who was married over the internet dies without a will and someone who would get a larger inheritance from the deceased’s estate claims that the surviving spouse should not inherit from the estate because the marriage was not valid. Disclaimer: I am not a lawyer. In accordance with ABA policy, this blog should not be viewed as legal advice. It is simply my experiences, opinions, and information I looked up on the internet. At 11:45pm on April 12, 2008, Mary Oberwetter and 17 friends engaged in silent dancing inside the Jefferson Memorial while listening to music on their headphones to celebrate Thomas Jefferson’s birthday. The Park Police arrested her when she refused their order to stop. Oberwetter was charged with interfering with an agency function and demonstrating without a permit, which violates the National Park Service Regulations. She responded by filing a lawsuit claiming that the police violated her First and Fourth Amendment rights. On May 17, 2011, the U.S. Court of Appeals affirmed the judgement that she was lawfully arrested and upheld the dismissal of her claims. After the ruling came down, five more protesters were arrested for dancing in the Jefferson Memorial over Memorial Day weekend. The group, led by Adam Kokesh and Edward Dickey, referred to their behavior as civil danceobedience. Many people, including Elie Mystal from Above the Law, found the ban on dancing in memorials disgusting. 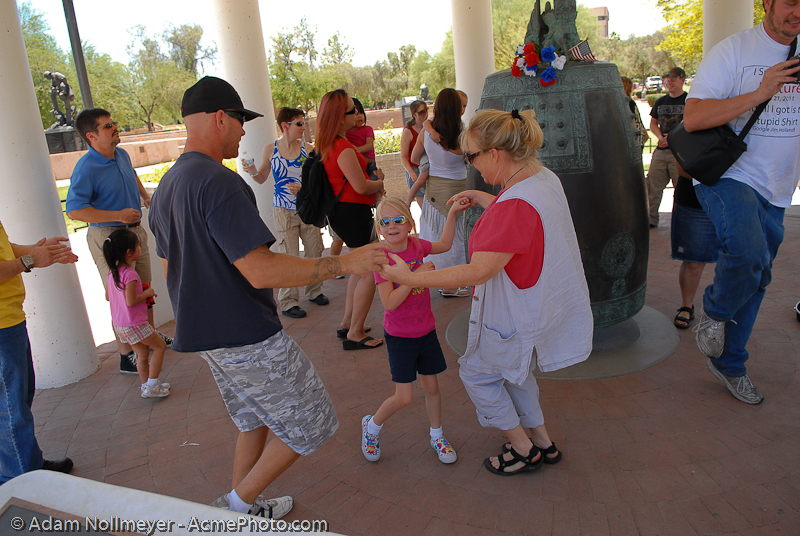 In response to the court ruling and the subsequent arrests, groups all over the world staged dancing events at memorials. It was reported that as many as 38 countries participated in the event, including demonstrations at the Jefferson Memorial and in Phoenix, Arizona. I could not find any reports of any arrests at any of the events. Unfortunately the problem here is the law is clear that any demonstration at a memorial won’t be tolerated. It’s sad, but that’s what it is. This event made me wonder, on what grounds might someone be arrested for dancing in public and what can people to prevent it? Assault: Assault requires intentionally, knowingly, or recklessly causing any physical injury to another person or placing them in reasonable apprehension of imminent physical injury. So as long as you keep your body at a sufficient distance from other people, I don’t think dancing constitutes assault. Trespass: Trespass requires knowingly entering or remaining unlawfully on any real property after a reasonable request to leave by the owner or any other person having lawful control over such property, or reasonable notice prohibiting entry. Public property, like parks containing memorials, are open to everyone so as long as no person with proper authority, dance on! Unlawful Assembly or Riot: These crimes require two or more people acting together with force or violence or threats of force that disturb the public peace. As long as you and your friends can dance without threatening anyone, then it’s ok.
Disorderly Conduct: This is a catch-all crime for general bad behavior; however, the law requires the intent to disturb the peace with unreasonable noise or violent or seriously disruptive behavior. I’m guessing you have to be a really bad dancer to rise to the level of seriously disruptive behavior. Obstructing a Thoroughfare: To obstruct a thoroughfare, you have to recklessly interfere with the passage of a thoroughfare by creating an unreasonable inconvenience or hazard without a legal privilege to do so. Thus, dancing on the grass, away from the sidewalk or otherwise not interfering with other people’s ability to use the sidewalk because of your dancing appears to be permissible. It’s important to note when you’re dancing at a memorial to look for any signage that indicated whether you are permitted to be on the memorial itself. 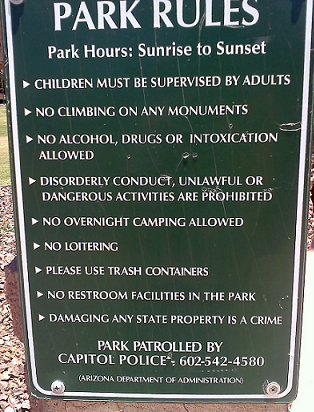 In Bolin Park in Phoenix, there are over a dozen memorials and statutes. 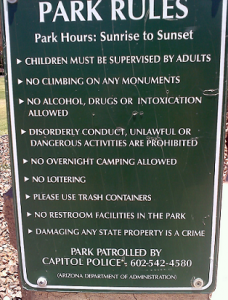 I was surprised that each one did not have a “Do Not Climb” plaque until someone pointed out that this notice was on the posted signs with all the rules regarding permitted behaviors in the park. We had a great time at the dance event in Phoenix. There was another rally going on and there was lots of police and security present. At one point we went over to their area and started dancing on the lawn when they started to play music. The police looked at us strangely and smiled. Thank you to Phoenix commercial photographer Adam Nollmeyer for shooting such awesome footage at the Phoenix Dance for Liberty Flash Mob.